This entry was posted in Managing risks & hazards on 2018/11/14 by Susan. B.C.’s craft beer industry is booming. Brewery employers need to look at safety issues like heavy lifting, confined spaces, and carbon dioxide exposure. Ten years ago, there were 54 craft breweries in B.C. Now there are 145. Personally, I’m a big fan of craft beer and it’s always a pleasure to talk with brewers who are so excited about their latest creations. Opening a brewery is a dream for many — and it’s inspiring to see people turning those dreams into reality. But in addition to all their creativity and award-winning recipes, it’s essential that craft brewers understand the importance of workplace health and safety. To find out more, I contacted WorkSafeBC’s Jose Barranco, an industry specialist who’s been speaking of safety with these microbreweries. When it comes to workplace injuries in breweries, back strains and other musculoskeletal injuries (MSIs) from overexertion are the most common. A full 50-litre keg of beer typically weighs about 140 pounds. Thankfully, there are tools available, such as dollies and keg lifts, to help brewhouse workers avoid MSIs. Another safety concern is working with carbon dioxide. This gas is released by the beer’s fermentation process and must be handled properly. WorkSafeBC’s poster Carbon dioxide in alcoholic beverage manufacturing shows the symptoms of exposure and provides tips on staying safe. Employers also need to plan for working in confined spaces (like the tanks you see in the above photo). They can put up this WorkSafeBC poster, Confined spaces in craft breweries, to help their workers be aware of the hazards of confined spaces found in craft breweries. Jose says there’s a real sense of community in the industry, which helps when it comes to promoting safety in the workplace. 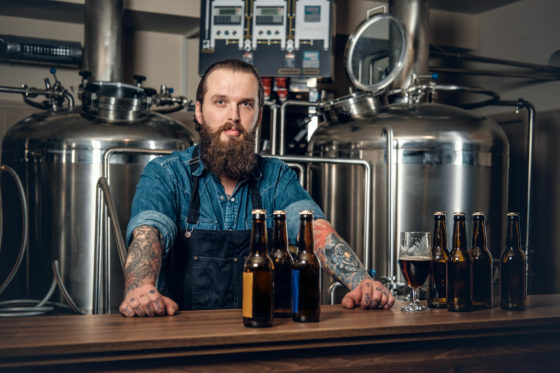 For more information about safety in the craft brewery industry, see Health and Safety for Craft Breweries and Distilleries from WorkSafeBC. The September/October 2018 issue of WorkSafeBC Magazine also profiles a local brewery’s efforts to keep its workers safe in the article Young workers have a voice at Vancouver brewing company. Thanks to Jose for telling me about his work.